Nothing ends an evening at Walt Disney World quite like dinner with a view of the nighttime shows. Restaurants with Fireworks Views offer a little extra if you can time the reservation to coincide with the fireworks show. 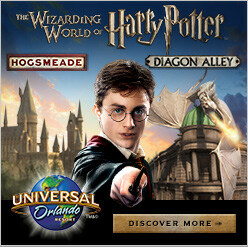 Reservations should be made for 45-60 minutes before the fireworks are scheduled to start. 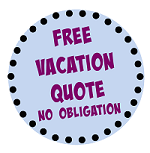 Arrive at the hostess stand at least 15 minutes prior to the reservation time. Ask the hostess to sit you where you can have a view of the fireworks, keeping in mind this might lead to a longer wait. The entire restaurant at California Grill has great views of the Magic Kingdom’s nighttime fireworks show thanks to the giant wall of windows. There is also an outdoor viewing deck for guests. The best perk of this restaurant is that if you had dinner early in the evening, you can return with your receipt and still watch the show from the viewing deck. 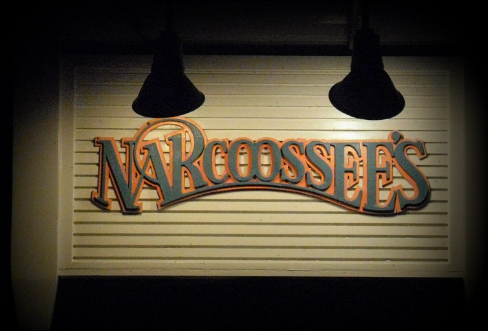 Narcoossee’s is located slightly to the left of the Magic Kingdom. There is a large viewing deck outside to view the fireworks. The restaurant is also tiered which allows for more tables to be able to view the fireworks. 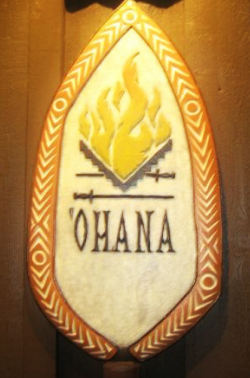 ‘Ohana is the least expensive dining option, while still having an optimal view of the Magic Kingdom fireworks. The restaurant has a giant wall of windows directly facing the castle. 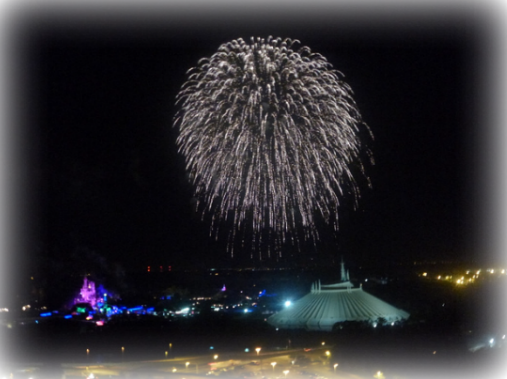 In addition to the restaurant, fireworks can also be seen from the beach at the resort. 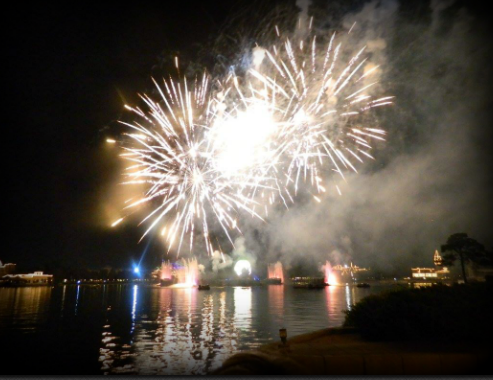 This restaurant offers great views of Epcot’s nighttime show “Illuminations”. 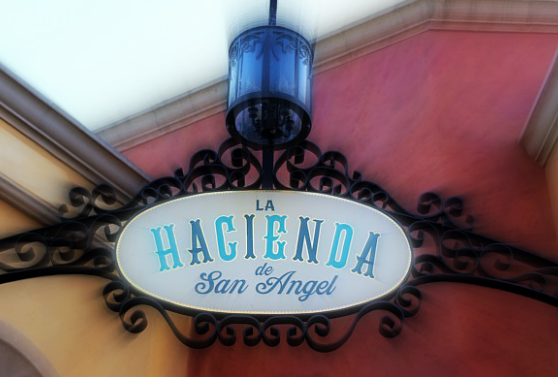 Thanks to the large windows, many tables in the La Hacienda de San Angel offer excellent views. There is not a patio or deck to view fireworks, so request a table by the window for the best view of the lagoon. This restaurant arguably has the best views of “Illuminations” from the outdoor patio section. However, Rose and Crown is also a very popular location for the nighttime show. Even with advanced reservations, it can be difficult to guarantee a seat on the patio. Due to the recent popularity of the restaurant during the fireworks show, the restaurant has enforced a policy that guests can only wait up to one hour for a patio table. After that hour, guests may either choose the table offered or choose not to dine at Rose and Crown. 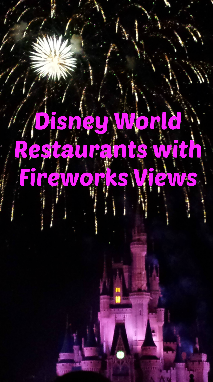 The best view of the fireworks at Tokyo Dining will be the seats along the windows. Although this restaurant boasts floor to ceiling windows, there are also several large columns located throughout the restaurant that can easily block your view. If you are not able to get a close window seat, there is also a public walkway outside of the restaurant. 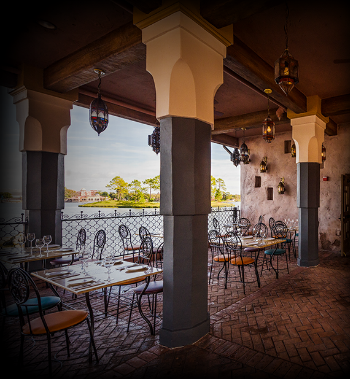 The Spice Road Table offers a large outdoor seating area which allows for more options to view the fireworks. Try to get an outdoor seat as close to the lagoon as possible in order to watch the show with the least amount of obstructions. This high-end restaurant is located on the second floor, which means that those who can get a table next to a window will have great views of the fireworks. 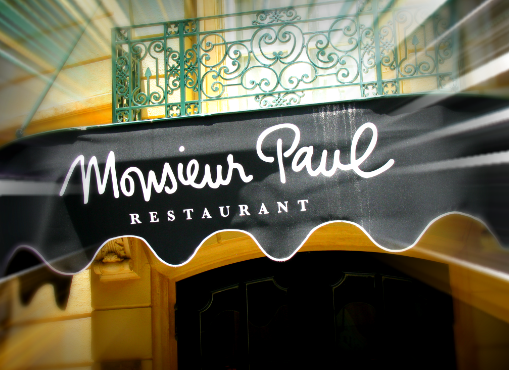 However, there are very limited tables at Monsieur Paul that are located in front of the windows, which are also relatively small compared to other restaurants. Guests sitting further back will have a difficult time seeing out of the small windows.